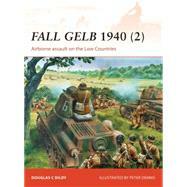 This highly illustrated title deals with the great blitzkrieg campaign of May/June 1940 as German forces poured through Holland and Belgium to confront the French and British. The campaign was audacious, relying on speed and feinting and maneuvers as much as superior force. In the end those qualities were to prove decisive to German success. Peter Dennis' superb illustrations illuminate a campaign which was in many ways ground-breaking, featuring the first ever airborne assault at a strategic level, and at this point the largest clash of armor in history.